Can cut down on electricity costs by finding out what appliances are actually worth keeping plugged in. Large LCD display displays consumption by the kilowatt-hour, the same as your local utility. 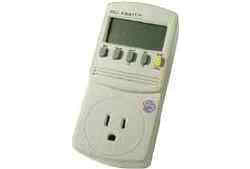 Calculate your electrical expenses by the day, week, month, even an entire year. Also check the quality of your power by monitoring voltage, line frequency, and power factor. Forecast costs. Cut your energy costs connecting appliances to the Kill A Watt EZ to assess how efficient they really are. The large LCD display displays consumption by the Kilowatt-hour. Shows the operating costs of your household appliances. Connect appliances into the Kill A Watt PS, to assess how efficient they are while the built-in surge protection keeps them safe. Advanced features such as over current, over voltage, and no load detection provide clean, safe power to your expensive equipment. Check the quality of your power by monitoring voltage, line frequency, amperage, kWH, current leakage, and more.